B.C. Dodge is joined by award winning artists Khalil Ismail and Umm Zakiyyah for this episode of “What a Relief!” — IRUSA’s official podcast. 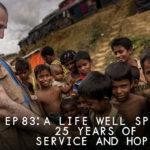 This What a Relief podcast episode kicks off a very special year for Islamic Relief USA—its 25th anniversary! This feature begins to unearth what turns out to be an epically inspiring history. The guest of honor just happens to have been there since day one. B.C. Dodge & R. Mordant Mahon talk to Omar Regan, founder of Halalywood, in this episode of “What a Relief!” — IRUSA’s official podcast. B.C. Dodge & R. Mordant Mahon are joined by Reem, Marketing Manager at IRUSA, in this episode of “What a Relief!” — IRUSA’s official podcast. B.C. Dodge & R. Mordant Mahon talk to Dalia Mogahed, director research at the ISPU, in this episode of “What a Relief!” — IRUSA’s official podcast. B.C. Dodge & R. Mordant Mahon talk to Sepna from Market Xcel in this episode of “What a Relief!” — IRUSA’s official podcast.